Several people have asked me how they can find out how their ancestors died. Unfortunately, records that list cause of death are routinely destroyed, so most often it will not be possible to find the cause of death. 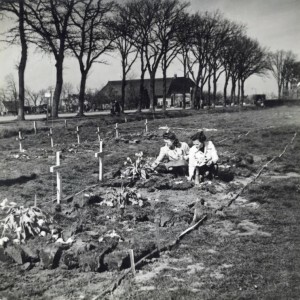 Dutch girls laying flowers on the graves of a temporary graveyard for killed Canadian soldiers. Edderwolde, The Netherlands, 1945.
a form that states the cause of death, but does not name the deceased. Those two forms are submitted to the clerk of the civil registration, who then creates a death record. Death records do not include the cause of death. The forms with the causes of death are sent on to the Central Bureau of Statistics for statistical analysis and subsequently destroyed. So most often, there will be no public records that state the cause of death. Although they were not supposed to, some municipalities kept declarations of cause of death that included the name of the deceased. Roosendaal in Noord-Brabant is an example, where these records have been kept since 1864. An online index is available at the West-Brabants Archief website. To see if such records exist for the town where your ancestors died, search for the words “doodsoorzaak,” “overlijdensoorzaak,” “doodsoorzaken” or “overlijdensoorzaken” [cause(s) of death], or “doodsbriefjes” [death notes] in the catalog of the website of the archive where the records for that town are kept. Prayer cards or family announcements in the newspaper may tell how a person died. Some deaths, like murders or accidents, were reported in the newspaper. If the person was in the military when he died, his military service records may include information. Some patient registers from hospitals have survived. These can typically be found in municipal or regional archives. Only records more than 100 years old will be public. Some church burial records from include the cause of death. It is rare to find a cause of death mentioned in burial records, but since it’s a record you’d want to consult anyway, it is easy to check. To be able to find the cause of death in these anonimyzed registrations, you’ll need the date of death and the numbers of the book (register), certificate and page on which the death is noted. With one, or a combination, of these numbers you’ll be able to identify the person you’re looking for. Very interesting, thank you. I did not know of this series and will definitely check it out the next time I’m there. In The Hague, in the eighteenth century, one kept the cause of death as part of the burial registration, and this is actually mentioned on the modern index cards.